Amazon Price: $86.00 (as of October 18, 2017 7:29 am - Details). Product prices and availability are accurate as of the date/time indicated and are subject to change. Any price and availability information displayed on the Amazon site at the time of purchase will apply to the purchase of this product. 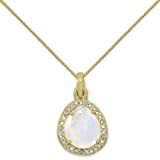 Hauntingly beautiful multicolor rainbow moonstone with a halo of twenty-nine 1.2mm single-cut gray diamonds set in 14k gold-plated sterling silver. The rainbow moonstone is 9.5mm x 11.5mm and approximately .64 ctw. The diamonds are approximately .047 ctw. Chain is our GFBX 14k gold-filled box chain that is 1mm in width. Your choice lengths.